Ok, so this may be a little outside of the topics that I normally cover but I feel compelled to share my recent harrowing culinary experience so that it might offer some preventative education for some poor soul out there. Over the summer, I shared with you how I had been experimenting as a beginner gardener in my backyard with my awesome vegetable garden. I harvested some amazing broccoli, tomatoes, onions, beets, sweet peppers and….jalapeno peppers. This week, I harvested the last of my peppers from the garden and I spent an hour or so cutting them all up and getting them ready for the freezer. When I was handling the jalapenos, my first mistake…and one that I’ll never make again….so long as I live…for definitely sure….is that I didn’t wear gloves. About 30 minutes after the peppers were all cut up, in freezer bags and in the freezer and I was getting dinner ready, I started to feel tingling in all of my fingers. The tingling quickly intensified to burning which intensified over the next 20 minutes to the point where it felt like my hands were literally on FIRE!! I immediately went to the sink and washed my hands with soap and water….no relief. That’s when I went to the all-knowing source of answers…GOOGLE. Through various websites and forums, I came across some hilarious stories of people with burning hands (and other sensitive body parts) as a result of a mishap with hot peppers as well as some extremely interesting and alternative solutions for the problem of burning Jalapeno Hands. Before I share with you some of the suggested solutions, it’s worth knowing a little bit of the science behind the active ingredient in hot peppers like jalapenos. This knowledge helps to understand why some of these seemingly bizarre things are presented as solutions and what is most likely to work. Capsaicin is the active ingredient in hot peppers like jalapenos that causes the ‘hot’. Painful exposures to capsaicin-containing peppers are among the most common plant-related exposures presented to poison centers. So that said, plain water will be ineffective at removing capsaicin but anything that is oily, alcohol or interestingly, milk should help. Milk contains casein, a lipophilic (fat-loving) substance that surrounds and washes away the fatty capsaicin molecules in much the same way that soap washes away grease. Now these things definitely help to cool the burn after you’ve eaten hot peppers but will they work on jalapeno hands? -I wrapped my hands in milk soaked cloths and sat on the couch looking sad for a half hour while John laughed at me. -I dipped my hands in yogurt and sat there for a half hour…same laughing from the peanut gallery. All of these things helped while my hands were in them but as soon as I took my hands out, the intense burning sensation returned within 2 minutes. Then, I decided to use reasoning instead of just looking for a quick fix. Several people in my google search had talked about using hot water to open pores. The last thing I wanted to do was stick my hands into hot water when they were scorching hot but it made sense to me that I had to open pores to get at the capsaicin in my skin. So…I had John test the water to tell me if it was too hot. (it felt like it was burning me when he said he could keep his hands in it all day) Then I used soap and scrubbed my hands under the hot water. It was extremely painful when I had my hands in the water at first, but it started to get better. After a good scrubbing with hot water (as hot as I could stand) and soap. I rubbed olive oil all over my hands. The hydrophobic oil picked up some of the hydrophobic capsaicin in my skin and removed it. Then I repeated the process 3 times. Hot water, soap, scrub, then oil. Not 100% but down to a 2 out of 10 pain instead of an 8 that I had been dealing with for 5 hours. I slept well and the next morning I felt normal except for slightly tender hands from the scrubbing. Sidenote: I think that the reason John never experienced Jalapeno hands even though he handled peppers many times, is that his hands are rough and calloused from his work….less chance for the capsaicin to get into the skin. Capsaicin's toxicity makes hot peppers more than just a food. They can also be a weapon. The Mayans burned chile peppers to create a stinging smoke screen and threw gourds filled with pepper extract in battle. Nowadays, capsaicin is the active ingredient in pepper sprays used to ward off attacking muggers, dogs, and bears. After my unfortunate jalapeno experience, I can now completely understand how hot peppers can be used to hurt others. But they really are delicious aren’t they? Prevention: Wear gloves anytime you are handling hot peppers like jalapenos. I read stories of poor people that suffered the jalapeno hands from handling and cutting just one jalapeno. 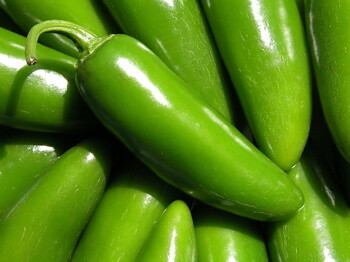 If you suffer jalapeno hands, run them under hot water (as hot as you can stand) and scrub with soap. Once you have done that, rub with oil (olive or vegetable). Repeat. For some cooling relief at any time during your jalapeno hands adventure try ice, cold water, cold milk or yogurt. Oh, and don’t try to take your contact lenses out….that would lead to tragic sad sad eyes. I slept with my contact lenses in that night. Dr. Peggy Malone is a Chiropractor and an Athlete who helps other athletes to overcome injury and get back to their sport. 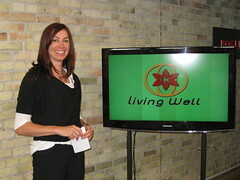 Her weekly Television Series 'Living Well" inspires people from all walks of life to take control of their health to be as happy and as healthy as they can be. Are We Connected on Twitter? | Come Write on My Facebook Page Wall! Are you ready for a challenge? Imagine if you put yourself first instead of last. Sign up here for my Free 21 Day Health Challenge. I'll show up in your inbox everyday for 21 days to inspire you to get healthier and happier! It really was funny despite the terrible pain. This exact thing happened to me. I was making THREE HUNDRED jalapeño poppers for a Christmas Eve party and once they were all cleaned and stuffed and ready for the oven my hands started burning! To the point that I was considering going to the ER. My husband was snoring on the couch, not knowing I was about ready to wake him up to take me to the hospital! So, like you, I googled home remedies and tried just about EVERTHING you did! The last one (posted similar to your post) by a fellow “burn victim” lol, said she tried mustard. Yes, plain mustard from the fridge. She said she lathered her hands in the mustard and put rubber gloves on. So, in desperation and one last ditch effort (before heading to the ER) I lathered my hands with mustard and within ONE MINUTE I started to feel relief! I put rubber gloves on (the ones like the doctors wear) and within ten minutes the burning was gone! I went to bed with the mustard and gloves on both my hands, clutching an ice bag. Woke up four hours later and washed my hands. The next day (at the party) everyone enjoyed and RAVED about how good the bacon wrapped jalapeño poppers were not knowing what I’d gone through to make them. My hands were so sore and I had yellow mustard under all my fingernails for days! Lesson learned, ALWAYS WEAR GLOVES WHEN PREPARING JALAPEÑOS!!! That’s a crazy and awesome addition to this story Tina! Mustard!! Cool. I’m glad you got some relief and I’m glad you’ll be wearing gloves from now on!! Glad you are feeling better Mary! After spending hours reading through ridiculous remedies, yours finally worked. I too figured that putting them under hot water seemed necessary. After all, the burn didn't kick in until after a while (probably once it absorbed through the pores of my hands). I tried sour cream, milk, vinegar, alcohol, and nearly pissed on my hands. And then I found this. Perfect. And the pain has subsided to about 20% like you said, nothing I can't handle. Brilliant. Of course it's only been 20 minutes, the pain could always come back. Maybe I just burned them beyond and feeling. That hot water on the burn was some intense amount of pain! Cheers. Dan, I’m so glad that you got some relief! The hot water definitely makes the difference despite being extremely painful at the time. thinking it might be a good idea because jalapeno hand is soooo unpleasant. Wonderful advice on how to treat burn from the peppers. I used gloves but theres always a chance of getting the oil on the skin. Good to know what helped you, incase people come in contact with peppers. Thank you! Yay! I’m glad you found the relief you needed. I remember how terrible the burn was. I used aloe vera. You know the kind you buy at the regular store (lime green colored) that you use after a sunburn. It worked right away. I reapplied when it felt like it might be coming back and that was it! The cheap kind from the dollar store. What a scary feeling that was. I too will never ever deal with those without gloves again! You just SAVED my hands! Make guacamole tonight and added a jalapeno; everything was fine. Took a hot shower later, which I am guessing opened up my pores to let the hot in: WHEW! They were on FIRE! Never experienced this until tonight. Thanks for the tips! I made this same terrible mistake. I am constantly washing my hands but no amount can fix this pain once that juice comes in contact with your skin. I cut that stupid jalapeño at like 5:30pm, it’s 2:36am and my hand feels like I dipped it in acid and set it on fire. I showered around 1:30am and that’s what Made my hand burn off. I had a slight burn on my ring finger sine about an hour after I cut the pepper but once I got in the shower life was over. I tried the hand washing and oil repeat but it unfortunately did not work for me. I took and ibuprofen and am going to try the burn gel. I’m hoping to find some relief so I can go to sleep!! Wish me luck I could use it right now!!!!!! I hope you are feeling better Jennifer! OMG!!! THANK YOU…THANK YOU…THANK YOU!! The last batch of bread and butter jalapenos was SO HOT I decided to seed and chop this batch rather than slice. It takes 6+ cups of prepared jalapenos, so you can imagine how many jalapenos I had to clean. I gave up on trying to use a knife and dove in with both hands. BIGGGGGG MISTAKE! After several hours of trying to wash, wash, wash, trying a baking soda paste, and soaking my hands in water (which helped only when I was moving the water around with my fingers), I finally painfully used my digits-of-fire to get online and found your tips. I used canola oil 3-4 times, following up with dish soap and then used olive oil twice, followed by dish soap. Then, I used another tip of alcohol, and then another using lemon juice, just for safe measure. They still burned some, but I sat down in my chair and was able to doze off. When I woke up 30 minutes to an hour later, the burn was basically GONE!!! WHAT A RELIEF! I really thought I had third degree burns and was going to have to go to the doctor! Now, I have another batch to do, since I didn’t do the double batch I had prepared to do yesterday. But the gloves are already out! Thank you so much!! OMG, you just saved my life. If I could only scrub well enough under my finger nail…. thou shall not scrape seeds out of peppers with fingernails! At least my fingers have eased up a bit. Thanks again! Thanks for your post! It helped me this morning – 14 HOURS AFTER! I tried everything through the evening but only provided a few minutes’ relief. The tomato method helped, but coming across your blog made me laugh that at least someone else had gone through it and went through the list of remedies too! Wow THANK YOU! I made guacamole with jalapeños almost 10 hours ago and my hands were fine. After I took a shower tonight (thus opening my pores) my left hand was on FIRE. Nothing that I found on the internet was helping until I found your suggestion. I had to do 4-5 rounds of hot water/wash, oil, hot water/wash. I also threw in a round of soaking my hands in milk. Pain is not 100% gone, but hopefully I will be able to get some sleep at least. Thanks again!! I don’t usually work with or eat hot peppers, but chopped a batch of 7 cups of Tabasco peppers to make sauce for my husband. No good deed goes unpunished. It has been 15 hours of the worst pain I could ever imagine. Tried every suggestion I found online. Your hot water method is excruciating, but I did it anyway. Somehow I’m not having the success you had. Back to alternating cups of milk I leave in the freezer. Thank you for this advice. I tried soap and water, vinegar, olive oil, vegetable oil, coconut oil, a bath, milk, yogurt, ice cream and rubbing alcohol. The pain kept increasing And nothing seemed to work until I used the warm water to open my pores first… Relief. Thank you! Hi, THANK YOU for posting this..this happened to me tonight and the pain was horrible…I mean horrible. I tried the milk..worked while it was in the liquid, but once my hands were out and dry…bad pain again. I found your post and put my hand in the hot water…man it hurt really bad and scrubbing was awful but it worked. It still burns but not half as bad…thank you. I cut chilli pepper with my bare hands and it felt like they were on fire. I tried to wash my hands with liquid soap and cold water to ease the hotness but it didn’t work. I felt like crying then I remembered Google and found to Dr Peggy. I tried the water I even made sure it was very hot cos I just didn’t like the discomfort, then I applied palm oil on my hands then I added liquid soap. It really helped calm my hands down. Thanks Dr Peggy. BLESS YOU! YOU ARE A LIFE SAVER! after having tried all the remedies with only the slightest effect, I stumbled on your idea of opening up the pores! Duh! As you said it is down to 20% and getting better. I used balsam oil. Stick with the hot water people! It’s tough but it doesn’t work if you don’t open the pores. Holy Jalapeño Fire Fingers! The only seconds that could free me from the fire burn of capsaicin was the giggle your blog provided. The warm water method made my knees buckle as I screamed out in pain. My final cure was Maalox. After four hours I read up on counter agents to pepper spray and came up with aluminum hydroxide and magnisium hydroxide. The pain went from a 9 to 2 in seconds. I had to keep applying for 30 – 45 minutes then I felt healed. This was a four hour ordeal for me that a simple care of gloves would have prevented. Tried your solution and it worked great. I had tried putting my hands in cold milk, and it worked fine as long as my hands were in the milk. When I took them out after about 2 minutes the burn came back. So I tried putting sugar in the milk (another suggestion from someone), same thing. I came across your remedy, and it worked great! I’m a whimp, so I can’t stand too hot of water, but it still worked just fine, and I only had some anti-bacterial hand soap with “exfoliating beads” (sand), so that’s what I used, then poured some olive oil on my wet hands, rubbed it all over and repeated the process. It’s been 45 minutes and only a slight burn has returned to just one of my fingers. I will try the process again to see if I can clear it all up. Now all I have to do, is see if hubby will take my contacts out 🙂 I don’t know why, but when you can’t touch your eyes they always seem to ITCH!!!!!! The oil and hot water trick … thanks! You are my hero!! Thank you so much for your advice and article! I went through the exact same process of trying to fix my burning hands last night. 2. sometimes you have to take one step back, before moving forward. Although it pained me to tears with the hot water…BLESS YOUR HEART!! Sweet sweet relief! Tried ALL kinds of remedies listed. Your 3x washing method (did 5) worked Soooo well! Thank You! I can finally get some sleep. Uhg, never again…. Thank you thank you thank you!! The hot water and oil wprked!!! Thanks for posting this! It’s the only thing to ease the pain so far and it’s now tolerable. Tried everything and my hands are still on fire- after 6 hours-certainly hope they are ok in the am and that I get some sleep! I diced two red jalapeños (the gardener told me the red jalapeños were not as hot as the green-wrong!) and decided not to use gloves-never again! So glad your remedy helped others…on the flip side, I added the peppers to cheese grits and the grits were the best I have ever tasted! Thank you SO much! This really helped…. Hi. I just wanted to thank you!!! Last night I was in unbearable pain. Had tried soaking hands in, ice water, double cream, olive oil, even wine!! But all of that only gave my hands a quick relief with no long lasting effect. At 2am this morning I tried google one more time as I knew I wouldn’t be getting any sleep and the pain was somehow getting worse! I came across this article and did as you said (my god it hurt) but was sooooooooooo pleased when finally the burning wasn’t as bad as the centre of a volcanoe (as that is what it had felt like for hours!) and more like a warmth from putting your hands near a fire, which I could cope with! I then put a fan on, put my hands infront of it and finally was able to sleep! Thank you so much I will never handle any type of chillie again with no gloves! And I especially won’t deseed really hot ones with my fingers!!! Ahhhh well, you live you learn! Ugh… I only found your site in my search for a cure to this burning tragedy and not before as a warning sadly. I have had my hands in what also felt like excruciatingly hot soapy water and oiled them and maybe I haven’t scrubbed hard enough but I am still suffering 24 hours later. Yeah you read that right. I did have periods of less pain in that time but now tonight I stupidly just peeled 10 lbs of tomatoes (for the salsa I cut the peppers for last night) and my hands in back on fire again. Maybe from the acid? Oh yeah… And last night before the full fire set in, I DID take one of my contacts out and the second I touched my eye I thought I might die. I used half a bottle of contact solution directly into my eye just to survive. My husband removed the other one. This has been a horrible ordeal and like you, one I’ll NEVER repeat. Gloves only!!!!! Thank you EVER so much! I had a great harvest of Dragon peppers this year. I made several jars of pickled peppers but still had a lot left over. So I decided to dry them and use the seeds as hot pepper flakes. It crossed my mind to use gloves but have never had a problem before. Needless to say I found myself in the same excruciating pain as you. Since reading your post I’ve done two rounds of hot water wash and olive oil and feel so much better already. THANK YOU THANK YOU THANK YOU!!! Thanks so much for sharing this. I had this yesterday and sadly didn’t find your post earlier, however the hot water also seemed to be the only helpful element. I went through the whole list. Vinegar, milk, yoghurt, alchohol, …. Strangly in my case the burning sensation started 6 hours after I handled only 2 jalapenos. Thank you SO much! this finally helped after reading a lot of online advice! Thank you Dr for the valuable advice! You saved my life-or at least my night! I’ve never handled jalapeno peppers before and I literally felt like my hands were burning off! Thank you and all the best to you! I can`t thank you enough for your advice for reducing the burning sensation after handling jalapenos. I had never suspected there would be problems. Today at about 5 PM, I made salsa and cut a jalapeno pepper without gloves. By 10 pm, three fingers of my left hand began feeling numb and burned. At about 12 AM, I read your post, followed your advice and now they feel much, much better. Thank you so much. Thank You! so glad I found this page. My poor hands have been burning all day. thanks to you their all better. Haha. I’m glad you are feeling better! Thanks for the tips going to try them. We have a garden also and i didnt want our cayenne or jalapenos to go to waste, we have soo many! I decided to try pickling them. I cut up at least 50 jalapenos and 30 cayenne. Felt fine till the next day my hands have been on FIRE lol its worse on my left hand as this was the one handling them most. I should of wore gloves, praying these remedies help!!!!! I hope you are feeling better. That burn is terrible…and definitely gloves are key from now on. It worked! I also tried everything you mentioned and nothing was helping. I washed dishes in soapy water, but even that didn’t help. But then I used the hottest water I could stand and used dish soap and rubbed my hands together and did this for a few minutes. Then I dried them and applied some olive oil. Then washed again in hot water and soap. That one cycle did it for me after trying everything else! Thanks for the hot water tip. I think that was key. Yes! The hot water seems to be key. I’m glad it worked for you. I know how awful that burn can be! Omg. Thank you so much. I cut a jalapeño pepper for the first time in my life completely oblivious to how dangerous these things are. Oh, the pain!! And I ate a small piece and my lips were burning. My mouth is fine now, but my hands had a delayed reaction…many thanks for this advice. I am on fire 🙁 🙁 comforting to know that this stuff is in my pepper spray should I ever need to use it! Powerful! Yes it is definitely powerful! And delicious 🙂 I’m glad you are feeling better. I thought I had nerve damage or something. I’m so glad you feel better. That would be especially scary if you didn’t know at first why your fingers were on fire. It works! I too am thankful you posted this remedy. I worked like a charm. We grow peppers every year to make pepper sauce. I have cut up my peppers each and every year the same way without gloves and have never had this reaction. As a matter of fact I cut some about a month earlier without gloves with no problem. This time I didn’t know what was going on until I touch my lips and rubbed my eyes and while driving the sun felt like it was burning my hands. It did take me long to began googling. Your solution worked the first time, I didn’t know what I was going to do. So, that you so much. THANK YOU!! I’m finally experiencing relief!! Should be able to sleep tonight! Yay! Glad to hear that you got some relief! Sorry to hear that you didn’t get relief with this method. I hope you are feeling better! In addition to the hot water and soap, I used technu made for poison oak. I’m glad you found a great solution and got some relief! This is seriously the only things that brought relief- thank you for your post!!! I’m so glad to hear that you got relief! That burn is terrible! I’ve been meaning to write a comment and tell you how thankful I was and still am for this post on jalapeño! I suffered so much from jalapeno hand burn last Thanksgiving for about 12 hours from 7pm to 7am with no sleep at all. Just like you, I tried everything else but did not work. But unlike you, I needed to repeat the cycle for 5 times til I felt some relief! I cried and never hated hot water that much in my life. It was torture. Again, thank you very much for saving my life! I’m so glad you finally got relief! I know how terrible that burn is. Gloves from now on!! Thank you for this! It truly was the only remedy that worked! After cutting 45 jalapeños my hands were on fire The other suggestions I found only provided temporary relief and it seemed like nothing would help! I too now know I’ll need gloves in the future! I’m the poor soul tonight! I thought it was onions or the potatoes i spend hours cutting…so i was typing the word “vegetables” when googling burning hands. & surprisingly this was the 1st post to come up. Nevermind its 4:36am Jan 6th 2018 lol 7 years after your inital post…your still helping people, thank you!! I’m so glad to hear that it helped! I know how terrible that burn is!! Tried all of these and none worked. If anyone is ever suffering from this horrible burning pain, use like juice!!! It works 100%! And not just “brings the pain down to a level 2” work but “pain completely gone” works. Squeeze fresh like juice on your hands, rub, let air dry, repeat if necessary. I also did this right before taking a 200mg of ibuprofen and fell asleep and woke up painless. Way better than burning your already burning hands with warm water ?? I’m glad you got relief with lime juice Jules. That isn’t the case for the majority of people. The oil trapped in the pores often needs the warm water to help it to escape so that it can then be pulled away from the skin with oil or citrus. The technique I’ve described here won’t further injure the skin as you’ve described. It feels like it’s burning but the warm water won’t add to the burn and many many people have gotten relief with this technique after trying a million other things (including using citrus). Remember your gloves for next time!! Thank you so much! You just helped me recover from after cutting up one jalapeño pepper earlier today. Who know they could inflict such pain! Hi Elizabeth. I’m so glad that you got relief. I always use gloves now but I remember how awful that burn is! I’m glad you got relief Sunny! The only other time I have ever experienced a sensation like this was after a steam burn. I cut up one jalapeno (it was an organic doozy of a jalapeno), but still just one, and about two hours later my hand started burning like crazy. Unbelievable pain. Caveat – it takes a while, and the process is very very painful (Just want to temper expectations out there). Running your hand under hot water during this is terribly unpleasant, but it works, alongside the dish soap and olive oil, it works. For me, it was not immediate relief and it took about 4 different washes, and then about 30-40 minutes later the burning sensation subsided a great amount. I also used aloe vera, which helps the pain as well. Thanks for this – and for all of you just stumbling upon this site trying to figure out what to do – try this, and stay strong. Gloves next time for sure. I’m glad you finally got some relief Mychael! And thank you for sharing your story so others can know that it won’t always be a pleasant or instant process to get rid of that burn! Definitely did the trick for me, thanks! I’m so glad to hear it Keith! That burn is terrible!! Thank you for your post!! I ended up touch my lips with my hands and oh my! My lips and skin around it was on fire! I’m so glad I found your post.. it’s finally calmed down! Thank you!! I’m so glad you got some relief Melissa! Thank you so much…you narrative sounded authentic and experienced…so I just started with ur suggestion rather than conduct my own field tests…now that’s 20 min after the scalding of my hands(I was hopping back&forth in TRUE agony for the first couple of cycles) the pain has subsided…NEVER AGAIN will I do anything with Jalepenos…NEVAH!!!! I’m glad to hear that you got relief! I know how much it burns!! AND NO GLOVES NEXT TIME…BECAUSE THERE WONT BE A NEXT TIME….EVAH!!!! Thank you so much 😊 this is the only thing that worked, I was miserable. I’m glad you are feeling better Tanya! First off the solution should have been the first in the first line. My hands were burning as I was scrolling for the answers. Hilarious story by the way, my husband laughed at me too. And yes it works great! Thanks for the solid advise!! I’m glad to hear that you are feeling better!! It’s 2018, 5th Of July, this happened to me earlier, I was suffering for 5hours now, Tried all and the only thing giving me relief is cold water and putting them infront of the aircon, I tried vinegar,milk and mustard so ridiculously thinking I’m going to die because the pain is unreal,I’m feeling weak because of the pain its making me tired, It’s not a joke! I never experienced a pain like this. Then i lie down and put my hands in front of the aircon just to keep me going,I’m actually about to go to the hospital! Those 20 Jalapenos almost killed me lol (Sorry but that’s what i felt,nobody will understand) Then I came across your blog as I do research, And you are right! I’m so glad to hear that you finally got relief!! Your story is so similar to mine….that burn is so terrible! A sleepless night due to the painful burning from the peppers. I finally came across your post and tried it. It took 6 cycles to get my hands to subside enough to maybe get some sleep. It is almost 5:30am and the burn came back but not nearly as bad,as before the remedy. Thank you Dr. Peggy! I’m so glad you finally got some relief!! My husband was cutting some earlier tonight and we tried all remedies you recommended with no relief. After the olive oil, hot water, soap, ect, he stated that his hands were still on fire. He reached for some GOJO pumice hand soap natural orange. (he got at Dollar General) He washed with that and some cold water. He finally got some relief. The burning has not gone all the way away, but it is better. Hope this helps. I literally tried 20 different things, found on other sites, and hands soaked in milk and/or yogurt worked, but only while soaked… as soon as I took them out, terrible burning sensation continued for FIVE hours… mustard, various oils, Clorox, Neosporin, lime, you name it – nothing worked…. that’s when I decided to try another site, THANK GOD and came upon your advice. The pain came down from 10 to 4 very quickly, and now – an hour later I think I’m good… looking forward to a great night sleep, this was stressful and exhausted. Thank you!! Ivana, I’m so glad you are feeling better! I know how terrible that burning is!! After reading your blog, I was reminded about hydrophobic materials. I have always sworn by putting lavender oil, 100% pure, on burns I might get from my woodstove or oven. It always helps so much. So I today with my jalepeno hands, I doused in lavender oil, mixed in some used coffee grounds for scrub and to absorb, and BUTTER! Very soothing! I did try your hot water trick, also. It really seemed to dull the edge of the jalepeno burn! Hi Evan, I’m glad to hear that you are feeling better! My mum told me of a old remedy. Rub on your hands/fingers with flour + oil mixture, like your rubbing lotion. Keep rubbing and rubbing until you feel the pain is gone. Then wash hands. The unbearable burning sensation pretty much went away to the point where it was easily ignored and no longer unbearable. I think if I would have kept rubbing it for longer, it would have gone away more. But I was just happy to get rid of the intense burning. Glad to hear that you are feeling better Lulu! Thanks so much for this. I tried all the usual cures but no joy. As brutal as the hot water was, I started feeling relief right away. I just did the procedure again and the pain is nearly gone. Lesson definitely learned. Gloves! Thanks peggy, happened to last night. Right hand was on fire. Cleaning jalapenos from my garden I did not put gloves on. I did take my contacts beforehand. I’m glad I googled this morning because it was still burning. I tried your remedy, it helped. Also I’m not going to put my contacts back in for a few days until I know it’s totally gone. Never again. Wow! I’m glad that you got some relief Katie! Hot water was the one thing that finally helped! I’d tried oil, mustard, yogurt, milk, alcohol, vinegar, scrubbing the *bleep* out of my skin. It wasn’t until I used as hot water as I could handle (able to gauge with my other hand that wasn’t burning), and massaging olive oil in that I finally had some relief. Don’t get me wrong, the hot water is AGONY, but it works in the end. Now I can carry on with my knitting pain free. I’m glad you got the burn under control Ashley. I know how terrible it can be! Thank you so much for this post!! My 12-year old son was helping make salsa and he got hot pepper fingers. After 3 hours of horrible pain/crying I almost took him to urgent care. I came across this post when nothing else worked and in 2 minutes of following your procedure…the pain was gone! Thank you!!! Tina, I’m so glad you shared this and I’m so glad that your son got relief!!! A Thousand thank yous! I did poppers yesterday but it really wasn’t until today, after a hot shower, that my hands started burning. The hot water and oil is the only thing that has helped. I could kiss you! I’m so glad you are feeling better Kathy! Bless you, bless you, bless you. Without this remedy, I would still be suffering horribly. I’m so thankful I came across this. I have been in tears for what seems like hours. Glad to hear you are feeling better! I am dealing with hot hands as we speak and it is the worst thing I have dealt with ever. I have tried everything and then I found ur post so I pray it will work because I am dying. First round hurt little hell well see here in a sec on second round, then third and then maybe try a four thank cause u have been the closest to pain level. I love u I just wrote u lol 10 minutes ago but said I would give update and we’ll I LOVE YOU!!!! I sat here for almost 6-7 hours doing everything I know and looked up and even called the hospital for advice just for them to tell me what I already knew, and then I found u. Thank you so very very very very much Doc!!!! I’m so glad that you got some relief!!! I know how terrible it is! After reading through the comments on here, it sounds like when you someday leave this world, you can know you improved the lives of many on this remedy alone! I’m so sorry to hear that you are still hurting. I hope you feel better soon! For how long did you do each step? I cut up 15 jalapeños last night and all night my left hand burned. WHOLE HAND! Finally woke up around 5am and saw this. I soaked/scrubbed for about 10 min then did oil for about 3 min n repeated that a few more times. All was good till this afternoon 1pm. Now it’s just my finger tips and they are burning worse then my hand did last night. I’m doing the steps all over again but would like to know how long to do each step. Hey Dulce, I didn’t time it. It was maybe a minute for each step and then repeat. I’m glad to hear that you sorted it out! I’m glad you got some relief!! The first line of the article should have been “If you suffer jalapeno hands, run them under hot water (as hot as you can stand) and scrub with soap. Once you have done that, rub with oil (olive or vegetable). ” In this case, don’t bury the lede. Just want to say thank you Peggy it totally worked! Pain level from 8/10 down to 1/10. Before coming across your page I have tried you name it – milk, ice water, aloe vera, repeated dish wash (but not hot water)/olive oil. I only needed to do it 2 times with your remedy but I also scrubbed off the olive oil after application too . So dishwash rub, scrub off under hot water, olive oil rub, scrub off under hot water . THANK YOU SO MUCH now I can go to sleep!! I’m glad to hear that you got some relief Gladys!